Just before the magical over, Yuvraj was being provoked by Andrew Flintoff. Mumbai: Back after nursing an injury, Sunrisers Hyderabad all-rounder Yuvraj Singh is targeting the May 6 IPL fixture against Gujarat Lions for his comeback into the squad. Yuvi twisted his ankle during the match against Australia in the ICC World T20 this year and was ruled out ahead of the crucial semifinal against West Indies. The 34-year-old however, is best known for his six sixes off Stuart Broad’s bowling against England in the ICC World T20 2007, giving fans that moment to cherish for times immemorial. 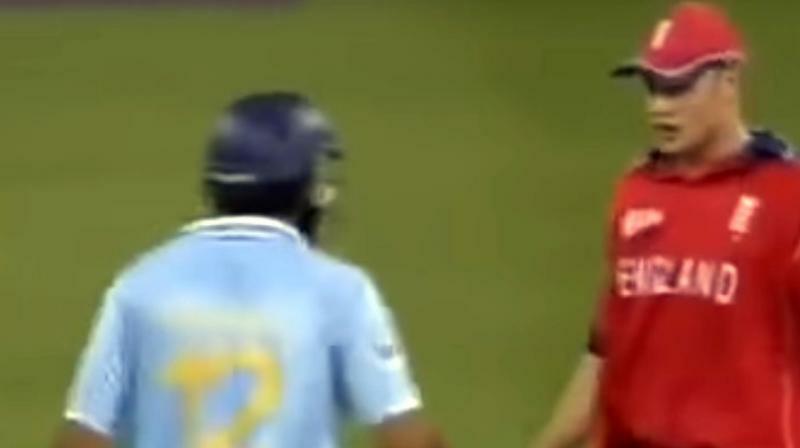 Just before the magical over, Yuvraj was being provoked by Andrew Flintoff. Now Yuvi has revealed what the England all-rounder said. However, the southpaw refused to speak the derogatory words uttered by Flintoff. Also Read: Is this the end for Yuvraj Singh or is another return in store? Yuvi said Flintoff told him, "Those were ____ridiculous shots, because I had hit him for two boundaries in that over. I said _____ you. Then he said, excuse me. I said you heard what I said. And he said I will cut your throat off. I said you see this bat in my hand. You know where I am gonna hit you with this bat?" When asked whether the heated exchange of words charged him up, the flamboyant left-hander said, "It got me really worked up. I was really angry and I just wanted to hit every ball out of the ground, just give it back. Sometimes, it's good for you. Sometimes, it backfires. But on that day I think it backfired them." Watch: What did Yuvraj Singh call Hardik Pandya? Yuvi related the incident to former Bollywood actress Simi Garewal during a TV show. ■Video| Yuvraj Singh finds new partner? ■Will Yuvraj Singh play in the semifinal against West Indies? ■IPL 8: With Yuvraj Singh, Zaheer Khan – can Delhi be the Daredevil? ■Video| What did Yuvraj Singh call Hardik Pandya? ■When Andrew Flintoff was asked to `f*** off` while boozing in PM's office! ■Is this the end for Yuvraj Singh or is another return in store?